Fiat Chrysler boss Sergio Marchionne has already achieved the near-impossible, turning around Chrysler, cutting debt and spinning off Ferrari at a luxury valuation. Now his grandiose ambitions for the carmaker are getting even bigger. His new targets for 2018 will require revenue to grow by 6.4 percent each year and annual operating profit to increase by 20 percent. Granted, Fiat Chrysler eked out even higher growth rates last year. But more than half of that impressive performance involved a factor beyond Marchionne’s control: a strong foreign-exchange tailwind. Healthy demand for cars in the United States also helped a lot. The group’s all-important U.S. market, which accounts for more than 60 percent of revenue and 80 percent of operating profit, may be peaking in 2016. Fiat’s own forecasts assume that total vehicle sales in 2018 in North America will be about 1 million below the 2016 level. Even more important, Marchionne is essentially burying a cornerstone of his 2014 growth strategy: plans to revive Alfa Romeo as a premium brand. He talked for years about attacking high-margin German luxury brands like Mercedes, BMW and Audi. Eight new Alfa models by 2018 and 5 billion euros in research and development and investment were supposed to turn Alfa into a powerful competitor. In the face of analysts’ skepticism, Marchionne doubled down on the plan with Alfa’s new Giulia sedan, unveiled last June with much fanfare. Even before the car aimed at competing against BMW’s 3 series and Mercedes’ C class hit showrooms, though, Fiat announced cuts to Alfa’s R&D and investment budget and delays in rolling out other models. 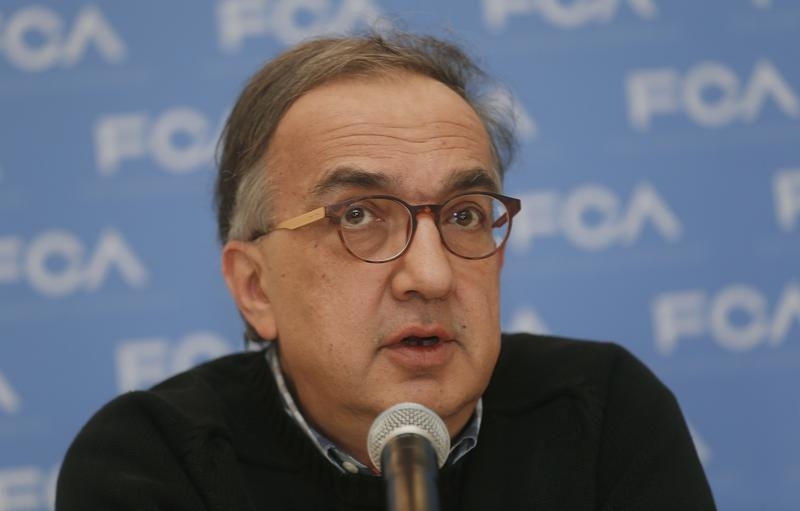 Marchionne said that the “launch cadence” has been “re-paced”. At just 5.5 times earnings for the next 12 months, Fiat Chrysler’s shares may look cheap. They trade at a roughly 13 percent discount to the shares of European and American peers, according to Thomson Reuters data. Higher multiples will be justified if Marchionne can deliver on his 2018 targets. But his zigzag on Alfa is an important warning sign. Like the brand’s revival strategy, the overall business plan may need to be, as Marchionne might put it, “re-paced”. Fiat Chrysler raised its financial targets on Jan. 27 following a better-than-expected performance in North America and Europe and strong sales of its Jeep brand. The carmaker said it expected adjusted operating profit of 8.7 billion to 9.8 billion euros in 2018 and revenue of around 136 billion euros, up from previous forecasts of 8.3 billion to 9.4 billion and around 129 billion respectively. The world’s seventh-largest carmaker by volume also beat fourth-quarter operating-profit estimates. Operating profit adjusted for restructuring costs, impairments and other one-offs stood at 1.6 billion euros in the October through December period, up from 1.18 billion euros in the previous year. Analysts on average had expected 1.3 billion euros. Sales rose 11 percent to 30.1 billion euros.